This summer, I’ll be teaching two sections of watercolor painting classes at the Honolulu Museum of Art School. I’ll also be teaching a 2-day calligraphy workshop on italic variations. For more information and to register, you can check out The Honolulu Museum of Art School. Experience the luminescence, spontaneity and immediacy of watercolor while sharpening your perceptions and sense of light and color. We progress through a series of exercises designed to lay the foundation for understanding and enjoying this famously difficult medium. We’ll develop the basics while at the same time learning to befriend our fears, cultivate confidence and embrace the wonder and delight of clear observation and spontaneous creation. Our painting will lead us to a deeper appreciation of the beauty and profundity of our everyday, ordinary world. In this 2-day workshop for experienced broad-edged pen calligraphers, we’ll take our exploration of the italic hand beyond the basics. After a brief refresher of the underlying geometry, form and rhythm of the alphabet, we’ll explore ways we can begin to consciously create variations and bring movement and life into our writing. In a systematic way, we’ll explore different approaches to variations and begin to develop our own preferences and personal style of italic. This class will include a more advanced study of the italic form in order to understand ways we might vary the form while still keeping its essence. Students should leave the workshop with a strong sense of how to approach creating variations in order to develop their own style and expressiveness. We’ll work primarily with the broad-edge pen, but we’ll also explore different writing tools and their effects on our calligraphy. Students are responsible for their own supplies. If desired, specific calligraphy supplies will be available for purchase from the instructor. This spring, I’ll be teaching two sections each of calligraphy and watercolor painting classes at the Honolulu Museum of Art School. For more information and to register, you can check out The Honolulu Museum of Art School. Learn the basics of this ancient art of “beautiful handwriting” while synchronizing your mind and body and cultivating inner calm. A single alphabet in its historical and contemporary form is used as the focus while different tools and techniques are used for practice. The study and practice of the letter forms with the broad-edged pen is complemented by design exercises to explore color, texture, and rhythm. In a contemplative atmosphere, emphasis is placed on the balance between the discipline of precise form and the freedom of artistic expression. NOTE: Beginning students will work toward understanding the underlying form and geometry of the hands we study and becoming familiar with the basic tools. Experienced students will continue to internalize the forms while developing methods of creatively altering rhythm and movement and exploring different tools. Students are responsible for their own minimal supplies, plus there is a $15 materials fee payable to the instructor that covers specific calligraphy supplies. On October 20th, I’ll once again be co-teaching a yoga and art workshop with Helena Kunst – Mindful Yoga and Contemplative Art. 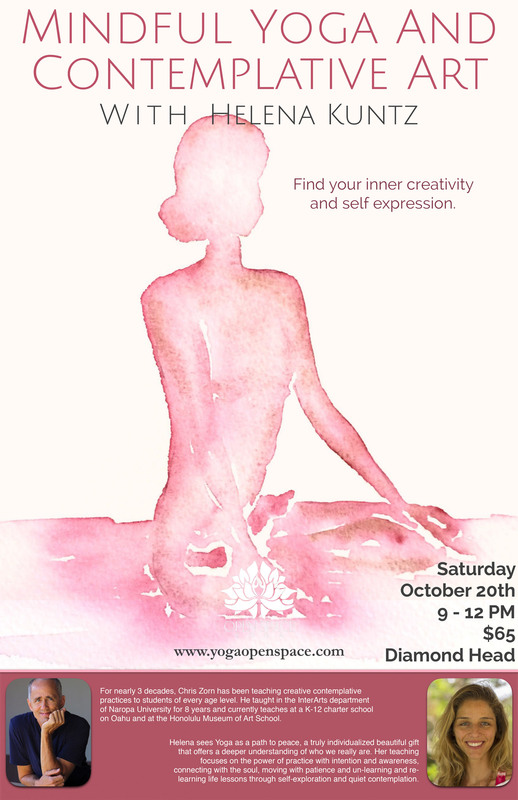 This time, we’ll be at the Open Space Yoga Studio at Diamond Head. You can check out the flyer here. Just like yoga, contemplative art is a way of cultivating presence. It helps bring us to the state of full awareness, where spontaneous expression flourishes. In this workshop, we’ll combine yoga and other body centered movements of yoga with simple contemplative art practices. In the process, we’ll connect with our creative source and learn to nurture this aspect of ourselves, which is all too often ignored in our fast paced, modern world. Connecting with and expressing our creativity helps us feel more balanced and alive and offers us a sense of relaxed spaciousness as we move through our everyday lives.